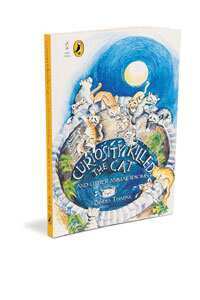 Curiosity Killed the Cat and Other Animal Idioms: By Bindia Thapar, Puffin-Ravi Dayal, 128 pages, Rs175. Well-illustrated books for children by Indian author-illustrators are rather thin on the ground. Thapar and a few others such as Suddhasatwa Basu, Atanu Roy, Tapas Guha, Sujata Singh, Ajanta Guhathakurta and Neeta Gangopadhyay are some of the exceptions. There is a story behind architect-by-training Thapar’s career as an illustrator. Radhika Menon—now publisher and managing editor of Tulika Books—was a neighbour who lived down the road. Menon, at that time, was a teacher at New Delhi’s Sardar Patel Vidyalaya, where their children were studying. Introduced to each other by their respective children, Menon wanted to know if Thapar would do some artwork for the school bulletin board. Thapar was game, and that triggered off a chain of events for Thapar. While the text was written by slain street theatre personality Safdar Hashmi, Thapar provided the drawings. Menon, Thapar and Moloyshree, (Hashmi’s wife) became good friends too. Thapar’s tribute to Hashmi came in the form of illustrations in a collection of his writing called Duniya Sabki—a book of poems that teach children the value of tolerance and sharing. Curiosity Killed the Cat… is fun. The simple, yet breathtaking illustrations will make sure the child will probably never forget the idiom he or she reads. Though the cat (Thapar has a cat which “was totally unhelpful" in this project, she says) gets the honours in the title, there are other animals that get pride of place. The cat theme came up because of Ravi Dayal, the editor-publisher and former chief executive of Oxford University Press. Sitting at his home one day, they observed some cats peeping in at the window and Dayal casually mentioned the line about curiosity killing the cat. One idiom led to another and soon, the idea of the book took root. Curiosity Killed the Cat… is Thapar’s homage to Dayal, who died suddenly last year. This book was really Ravi Dayal’s idea, she proclaims in the credits. Some of the more delightful illustrations come with: To have more fun than a barrel of monkeys, to be or feel like a fish out of water, top dog and the rat race. The back of the book has a chapter on how to use (read) the book. There is also a portrait gallery that features meanings of words such as aquiline, asinine, batrachian, murine and vulpine. Learning could not be more fun. Known for visually-enhanced children’s books such as The Runaway Puppy, The Magic Raindrop and stories about Tara, the Little Elephant, Thapar keeps her illustrations simple. An admirer of Eric Carle (The Very Hungry Caterpillar), Maurice Sendak (Little Bear, Where Wild Things Are), Adrienne Kennaway (The Awful Aardvark, The Crafty Chameleon), Garth Williams (Charlotte’s Web, The Rabbit’s Wedding), Quentin Blake (the Roald Dahl’s books) and Indians such as Suddho, Ajanta, Mickey Patel and Atanu, Thapar is disappointed that illustrated books for children haven’t taken off in India. And, she would love for more children took to drawing. For that, observation power is what matters. “Everyone," she says, “can draw. But not everyone can see." Giving the child a pencil and paper and the freedom to draw whatever catches his or her eye is the way to go. “Don’t let mistakes hinder," is her advice. “Making mistakes is fine. The child shouldn’t be scared to express herself. I’m grateful that I made mistakes." The best part about an illustrated book is that it doesn’t need language. For Thapar, personally, nothing is more pleasurable than taking a sheet of paper and starting an illustration. The pleasure, for the reader, is equally exquisite.